Other serious bacterial infections suitable for parenteral antibiotic therapy. CEFOTAX may be used for pre-operative prophylaxis in patients undergoing surgical procedures, that may be classified as contaminated or potentially so. CEFOTAX may be administered intravenously by bolus injection or by infusion, or by intramuscular injection. The dosage, route and frequency of administration should be determined by the severity of infection, the sensitivity of causative organisms and condition of the patient. Therapy may be initiated before the results of sensitivity tests are known. The recommended dosage for mild to moderate infections is 1 g 12 hourly. However, dosage may be varied according to the severity of the infection, sensitivity of causative organisms and condition of the patient. Therapy may be initiated before the results of sensitivity tests are known. In severe infections dosage may be increased up to 12 g daily given in three or four divided doses. For infections caused by sensitive Pseudomonas species, daily doses of greater than 6 g will usually be required. The usual dosage range is 100-150 mg/kg/day in two to four divided doses. However, in very severe infections, doses of up to 200 mg/kg/day may be required. The recommended dosage is 50 mg/kg/day in two to four divided doses. In severe infections 150-200 mg/kg/day, in divided doses, have been given. Because of extra-renal elimination, it is only necessary to reduce the dosage of CEFOTAX in severe renal failure (GFR < 5 ml/min=serum creatinine approximately 751 micromol/litre). After an initial loading dose of 1 g, daily dose should be halved without change in the frequency of dosing, i.e. 1 g twelve hourly becomes 0.5 g twelve hourly, 1 g eight hourly becomes 0.5 g eight hourly, 2 g eight hourly becomes 1 g eight hourly etc. As in all other patients, dosage may require further adjustment according to the course of the infection and the general condition of the patient. No dosage adjustment is required. Intravenous and Intramuscular Administration: Reconstitute CEFOTAX with Water for Injection as directed in (Special Precautions for Disposal and Other Handling). Shake well until dissolved and then withdraw the entire contents of the vial into the syringe. Intravenous administration (Injection or Infusion): CEFOTAX may be administered by intravenous infusion using the fluids stated in (Special Precautions for Disposal and Other Handling). The prepared infusion may be administered over 20-60 minutes. For intermittent I.V. injections, the solution must be injected over a period of 3-5 minutes. During post-marketing surveillance, potentially life-threatening arrhythmia has been reported in a very few patients who received rapid intravenous administration of cefotaxime through a central venous catheter. CEFOTAX and aminoglycosides should not be mixed in the same syringe or perfusion fluid. Hypersensitivity to cefotaxime, to other cephalosporins or to any of the excipients. Previous immediate and/or severe hypersensitivity reaction to a penicillin or to any other beta-lactam medicinal product. Special caution is required to determine any other type of previous hypersensitivity reactions to penicillin or to other beta-lactam medicinal products because patients hypersensitive to these medicines may be hypersensitive to cefotaxime as well (cross- allergy). As with other antibiotics, the use of cefotaxime, especially if prolonged, may result in overgrowth of non susceptible organisms, such as Enterococcus spp., Candida, and Pseudomonas aeruginosa. Repeated evaluation of the condition of the patient is essential. If superinfection occurs during treatment with CEFOTAX, appropriate measures should be taken and specific antimicrobial therapy should be instituted if considered clinically necessary. Anaphylactic reactions: Preliminary enquiry about hypersensitivity to penicillin and other beta-lactam antibiotics is necessary before prescribing cephalosporins, since cross allergy occurs in 5–10% of cases. The use of CEFOTAX is strictly contraindicated in subjects with a previous history of immediate-type hypersensitivity to cephalosporins. Since cross allergy exists between penicillins and cephalosporins, use of the latter should be undertaken with extreme caution in penicillin-sensitive subjects. Serious, including fatal hypersensitivity reactions have been reported in patients receiving cefotaxime. If a hypersensitivity reaction occurs, treatment must be stopped. Serious bullous reactions: Cases of serious bullous skin reactions like Stevens-Johnson syndrome or toxic epidermal necrolysis have been reported with cefotaxime (see Undesirable Effects). Patients should be advised to contact their doctor immediately prior to continuing treatment if skin and/or mucosal reactions occur. Patients with renal insufficiency: The dosage should be modified according to the creatinine clearance calculated. Patients with severe renal dysfunction should be placed on the dosage schedule recommended under “Dosage and Administration”. Caution should be exercised if cefotaxime is administered together with aminoglycosides or other nephrotoxic drugs. Renal function must be monitored in these patients, the elderly, and those with pre-existing renal impairment. Haematological reactions: Leukopenia, neutropenia, and more rarely, agranulocytosis may develop during treatment with cefotaxime, particularly if given over long periods. For treatment courses lasting longer than 7-10 days, the blood white cell count should be monitored; and treatment stopped in the event of neutropenia. Some cases of eosinophilia and thrombocytopenia, rapidly reversible on stopping treatment, have been reported. Cases of haemolytic anaemia have also been reported. Sodium intake: The sodium content of CEFOTAX should be taken into account when prescribing to patients requiring sodium restriction. Clostridium difficile-associated disease (e.g. Pseudomembranous colitis): Cefotaxime may predispose patients to pseudomembranous colitis. Although any antibiotic may predispose to pseudomembranous colitis, the risk is higher with broad spectrum drugs, such as cephalosporins. This side effect, which may occur more frequently in patients receiving higher doses for prolonged periods, should be considered as potentially serious. Diarrhoea, particularly if severe and/or persistent, occurring during treatment or in the initial weeks following treatment, may be symptomatic of Clostridium difficile associated disease (CDAD). CDAD may range in severity from mild to life-threatening, the most severe form of which is Pseudomembranous colitis. The diagnosis of this rare but possibly fatal condition can be confirmed by endoscopy and/or histology. It is important to consider this diagnosis in patients who present with diarrhoea during or subsequent to the administration of CEFOTAX. If a diagnosis of pseudomembranous colitis is suspected, CEFOTAX should be stopped immediately and appropriate specific antimicrobial therapy should be started withoutdelay. Clostridium difficile associated disease can be favoured by faecal stasis. Medicinal products that inhibit peristalsis should not be given. Neurotoxicity: High doses of beta-lactam antibiotics, including cefotaxime, particularly in patients with renal insufficiency, may result in encephalopathy (e.g. impairment of consciousness, abnormal movements and convulsions). Patients should be advised to contact their doctor immediately prior to continuing treatment if such reactions occur. Precautions for administration: During post-marketing surveillance, potentially life-threatening arrhythmia has been reported in a very few patients who received rapid intravenous administration of cefotaxime through a central venous catheter. The recommended time for injection or infusion should be followed. Effects on Laboratory Tests: As with other cephalosporins, a positive Coombs' test has been found in some patients treated with cefotaxime. This phenomenon can interfere with the cross-matching of blood. Urinary glucose testing with non-specific reducing agents may yield false-positive results. This phenomenon is not seen when a glucose oxidase specific method is used. When dissolved in Water for Injections PhEur, CEFOTAX forms a straw-coloured solution suitable for intravenous and intramuscular injection. Variations in the intensity of colour of the freshly prepared solutions do not indicate a change in potency or safety. Whilst it is preferable to use only freshly prepared solutions for both intravenous and intramuscular injection, CEFOTAX is compatible with several commonly used intravenous infusion fluids and will retain satisfactory potency for up to 24 hours at room temperature in the following: Water for Injection, sodium chloride intravenous infusion, 5% glucose intravenous infusion, sodium chloride and glucose intravenous infusion, compound sodium lactate intravenous infusion (Ringer-lactate solution for injection). 1-2 g CEFOTAX are dissolved in 40-100 ml of infusion fluid. CEFOTAX is also compatible with metronidazole infusion (500 mg/100ml) and both will maintain potency at room temperature for up to 24 hours. Some increase in colour of prepared solutions may occur on storage. However, provided the recommended storage conditions are observed, this does not indicate change in potency or safety. Aminoglycoside antibiotics and diuretics: As with other cephalosporins, cefotaxime may potentiate the nephrotoxic effects of nephrotoxic drugs such as aminoglycosides or potent diuretics (e.g. furosemide). Renal function must be monitored. Uricosurics: Probenecid interferes with renal tubular transfer of cephalosporins, thereby delaying their excretion and increasing their plasma concentrations. A false positive Coombs' test may be seen during treatment with cephalosporins. This phenomenon may occur during treatment with cefotaxime and can interfere with blood cross-matching. A false positive reaction to urinary glucose may occur with copper reduction methods (Benedict's, Fehling's or Clinitest) but not with the use of specific glucose oxidase methods. There is a potential for mezlocillin and azlocillin to reduce the clearance of cefotaxime. The safety of cefotaxime has not been established in human pregnancy. Animal studies do not indicate direct or indirect harmful effects with respect to reproductive toxicity. There are, however, no adequate and well-controlled studies in pregnant women. Cefotaxime crosses the placental barrier. 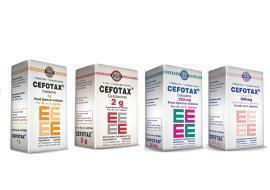 Therefore, CEFOTAX should not be used during pregnancy unless the anticipated benefit outweighs any potential risks. Cefotaxime passes into human breast milk in small amounts and is usually compatible with breastfeeding, but careful monitoring of the infant is recommended. Effects on the physiological intestinal flora of the breastfed infant leading to diarrhoea, colonisation by yeast-like fungi, and sensitisation of the infant cannot be excluded. Therefore, a decision must be made whether to discontinue breastfeeding or to discontinue CEFOTAX taking into account the benefit of breastfeeding for the child and the benefit of therapy for the woman. Cefotaxime has been associated with dizziness, which may affect the ability to drive or operate machinery. There is no evidence that cefotaxime directly impairs the ability to drive or to operate machines. High doses of cefotaxime, particularly in patients with renal insufficiency, may cause encephalopathy (e.g. impairment of consciousness, abnormal movements and convulsions). Patients should be advised not to drive or operate machinery if any such symptoms occur. The side effects are classified according to organ class to Very common (≥1/10), Common; (≥1/100 to <1/10); Uncommon (≥1/1,000 to <1/100); Rare (≥1/10,000 to <1/1,000); Very rare (<1/10,000); Not known (cannot be estimated from available data)*. Not known: Neutropenia, granulocytopenia, agranulocytosis, haemolytic anaemia. Not known: Anaphylactic reactions, angioedema, bronchospasm, anaphylactic shock. Not known: Headache, dizziness, encephalopathy (e.g. impairment of consciousness, abnormal movements). Not known: Arrhythmia following rapid bolus infusion through central venous catheter. Not known: Nausea, vomiting, abdominal pain, pseudomembranous colitis. Uncommon: Increase in liver enzymes (ALT, AST, LDH, gamma-GT and/or alkaline phosphatase) and/or bilirubin. Not known: Hepatitis* (sometimes with jaundice). Uncommon: Rash, pruritus, urticaria, drug fever. Not known: Erythema multiforme, Stevens-Johnson syndrome, Toxic epidermal necrolysis. Uncommon: Decrease in renal function/increase of creatinine (particularly when co-prescribed with aminoglycosides). Not known: Interstitial nephritis, candidiasis. Very common: For IM formulations: Pain at the injection site. Uncommon: Fever, inflammatory reactions at the injection site, including phlebitis/thrombophlebitis. For the treatment of borreliosis, a Jarisch-Herxheimer reaction may develop during the first days of treatment. The occurrence of one or more of the following symptoms has been reported after several week's treatment of borreliosis: skin rash, itching, fever, leucopenia, increase in liver enzymes, difficulty of breathing, joint discomfort. Increase in liver enzymes (ALT, AST, LDH, gamma-GT and/or alkaline phosphatase) and/or bilirubin have been observed. These laboratory abnormalities may rarely exceed twice the upper limit of the normal range and elicit a pattern of liver injury, usually cholestatic and most often asymptomatic. Symptoms of overdose may largely correspond to the profile of side effects. There is a risk of reversible encephalopathy in cases of administration of high doses of beta–lactam antibiotics including cefotaxime. In case of overdose, CEFOTAX must be discontinued, and supportive treatment initiated, which includes measures to accelerate elimination, and symptomatic treatment of adverse reactions (e.g. convulsions). No specific antidote exists. Serum levels of cefotaxime may be reduced by peritoneal dialysis or haemodialysis. Pharmacotherapeutic group: Beta-lactam antibiotics, Cephalosporins. Mode of action: Cefotaxime is a third generation broad spectrum bactericidal cephalosporin antibiotic. The bactericidal properties are due to the inhibitory effect of cefotaxime on bacterial cell wall synthesis. Mechanisms of resistance: Resistance to cefotaxime may be due to production of extended-spectrum beta-lactamases that can efficiently hydrolyse the drug, to the induction and/or constitutive expression of AmpC enzymes, to impermeability or to efflux pump mechanisms. More than one of these possible mechanisms may co-exist in a single bacterium. After a 1000 mg intravenous bolus, mean peak plasma concentrations of cefotaxime usually range between 81 and 102 microgram/ml. Doses of 500 mg and 2000 mg produce plasma concentrations of 38 and 200 microgram/ml, respectively. There is no accumulation following administration of 1000 mg intravenously or 500 mg intramuscularly for 10 or 14 days. The apparent volume of distribution at steady-state of cefotaxime is 21.6 litres/1.73 m2 after 1 g intravenous 30 minute infusion. Concentrations of cefotaxime (usually determined by non-selective assay) have been studied in a wide range of human body tissues and fluids. Cerebrospinal fluid concentrations are low when the meninges are not inflamed, but are between 3 and 30 microgram/ml in children with meningitis. Cefotaxime usually passes the blood-brain barrier in levels above the minimum inhibitory concentration of common sensitive pathogens when the meninges are inflamed. Concentrations (0.2-5.4 microgram/ml), inhibitory for most Gram-negative bacteria, are attained in purulent sputum, bronchial secretions and pleural fluid after doses of 1 or 2 g. Concentrations likely to be effective against most sensitive organisms are similarly attained in female reproductive organs, otitis media effusions, prostatic tissue, interstitial fluid, renal tissue, peritoneal fluid and gall bladder wall, after usual therapeutic doses. High concentrations of cefotaxime and desacetyl-cefotaxime are attained in bile. Cefotaxime is partially metabolised prior to excretion. The principal metabolite is the microbiologically active product, desacetyl-cefotaxime. Most of a dose of cefotaxime is excreted in the urine - about 60% as unchanged drug and a further 24% as desacetyl-cefotaxime. Plasma clearance is reported to be between 260 and 390 ml/minute and renal clearance 145 to 217 ml/minute. After intravenous administration of cefotaxime to healthy adults, the elimination half-life of the parent compound is 0.9-1.14 hours and that of the desacetyl metabolite, about 1.3 hours. In neonates the pharmacokinetics are influenced by gestational and chronological age, the half-life being prolonged in premature and low birth weight neonates of the same age. In severe renal dysfunction the elimination half-life of cefotaxime itself is increased minimally to about 2.5 hours, whereas that of desacetyl-cefotaxime is increased to about 10 hours. Total urinary recovery of cefotaxime and its principal metabolite decreases with reduction in renal function. Before reconstitution, store at a temperature not exceeding 30°C. After reconstitution, store at room temperature for 24 hours or store at 2°C - 8°C for 10 days. CEFOTAX 250 mg Vials should be used immediately after reconstitution. CEFOTAX 250 mg, 500 mg Vials: Box containing 1 vial + 1 ampoule (2 ml) of Sterile Water for Injection) solvent. CEFOTAX 500 mg Vials: Box containing 1 vial + 1 ampoule (2 ml) of Sterile Water for Injection) solvent. CEFOTAX 1 g Vials: Box containing 1 vial + 1 ampoule (5 ml) of Sterile Water for Injection. CEFOTAX 2 g Vials: Box containing 1 vial + 2 ampoules (5 ml) of Sterile Water for Injection.